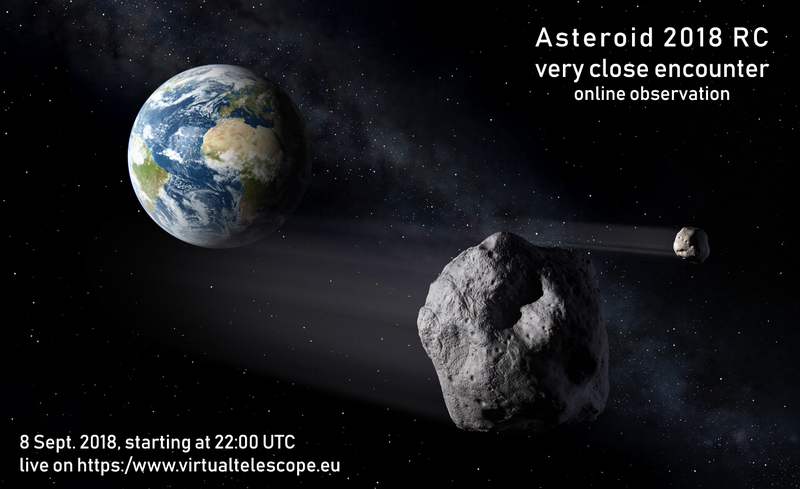 Next 9 Sept. 2018, the near-Earth Asteroid 2018 RC will have a very close, but safe, encounter with us, coming at about 220.000 km from the Earth’s surface, 50% of the lunar distance. The Virtual Telescope Project will show it to you live. The near-Earth asteroid 2018 RC, discovered by the ATLAS survey (Hawaii) on 3 Sept. 2018 and announced the next day by the Minor Planet Center, has an estimated diameter in the range 32-71 meters and, just before its flyby, it will be visible with small (10 cm large) telescopes, as a 12 mag. dot of light. The live feed will start on 8 Sept. 2018, at 22:00 UTC, when it will be close to its maximum brightness.